Last night, MOD Developments celebrated the launch of the Massey Tower Presentation Centre, which will be open to public starting this weekend. 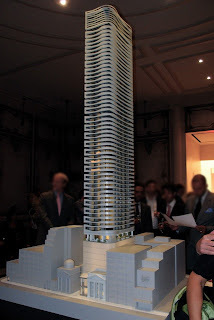 Located at 197 Yonge St, the new Massey Tower will occupy the historical Bank of Commerce Building. MOD will completely restore the four-storey portion of the bank, transforming it into Massey Tower’s elegant new lobby. Described as "Toronto’s Heritage Landmark Combine Classical with Contemporary Design", another noteworthy feature is its fantastic location. The 60-storey, modern point-tower will be located in the heart of Toronto, with the bustling financial district to the west and the historic St. Lawrence neighbourhood to the east. It is also within easy access to St. Mike’s Hospital, the University of Toronto and the University Health Network Hospitals. Ryerson University and George Brown College are also just a short stroll away. For those looking for leisure activities, entertainment venues, such as the Ed Mirvish Theatre, the Air Canada Centre, Yonge Dundas Square and the Rogers Centre are all nearby. Residents can also wander down to the shores of Lake Ontario to take part in any number of outdoor activities. Not to mention that it is also just minutes from major highways!